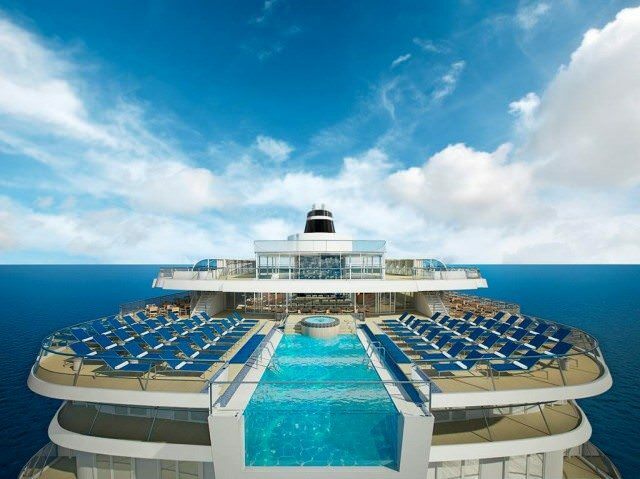 With Viking Star, Viking is actively targeting the same sort of folks who might sail with lines like Azamara Club Cruises, Celebrity Cruises, Holland America Line and Oceania Cruises, yet Viking Ocean Cruises offers guests a completely different ship — and an innovative onboard product. See Viking Star: Day 3, Cartagena, Spain, Has Viking Created A New Category Of Ocean Cruiser? For starters, the ship: Viking Star features a glass-backed infinity pool, a two-story forward-facing observation lounge and all-balcony accommodations. These are just a handful of the features that set the 930-guest Viking Star apart from her competitors, not to mention sleek, nautical styling that Torstein Hagen himself was quick to point out during the launch of the new cruise line at the Beverly Hilton hotel in Los Angeles in March of 2013. Viking’s onboard program is equally impressive: One complimentary shore excursion in each port. Complimentary beverages, including wines and beers with lunch and dinner. Complimentary wi-fi internet access. Real king-sized beds. No charges for dining in specialty restaurants. And Viking offer its cruises at a lower cost than its competitors. Viking Star’s main dining room is called The Restaurant, featuring local specialties alongside classic American fare. Much of the food is based on the itinerary being operated, such as Venetian risotto on sailings from Venice, or perhaps a traditional Turkish meze as Viking Star sails the Bosphorus. Other dining options include the internationally themed World Café located on Deck 7, and on deck 2, Manfredi’s and The Chef’s Table, the ship’s signature restaurants. Both offer intimate experiences and authentic cuisine. Viking has come up with an interesting concept to control the availability of these experiences: Rather than offer them at an additional surcharge, Viking has made the restaurants available reservations-only depending on the stateroom category booked. Like the Viking Longships, Viking Star has an Aquavit Terrace, which faces aft, toward the striking Infinity Pool, as opposed to forward on the Viking Longships. The Silver Spirits beverage package covers special wines-by-glass selections, beers, espresso drinks, juices and mineral water for the entire duration of your cruise, plus cocktails and a bottle of sparkling wine. The Silver Spirits Beverage Package goes for US $29.95 per day, per person. Veranda Staterooms measure 270 square feet and feature king-sized beds and spacious balconies. 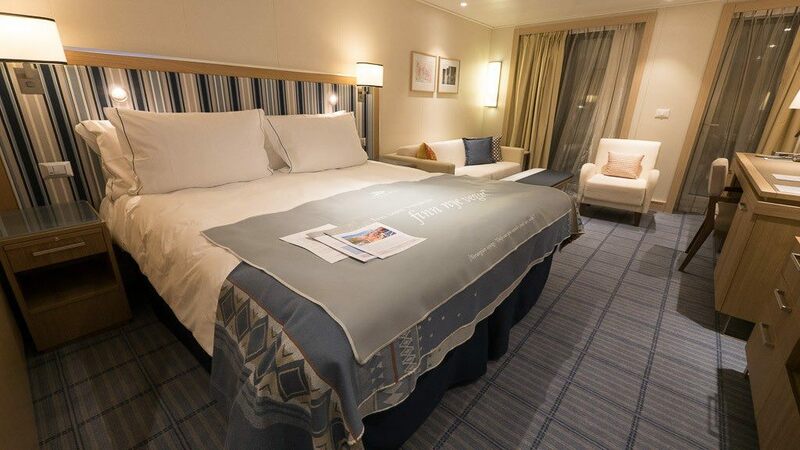 These staterooms are situated on Deck 3, one deck above the Viking Star’s Promenade Deck. This category does not include reservations at Manfredi’s or The Chef’s Table, or priority reservations at The Restaurant. Deluxe Veranda Staterooms also measure 270 square feet, but include the dining perks. There’s also in-room coffee and mini-bar services and priority reservations in The Restaurant. 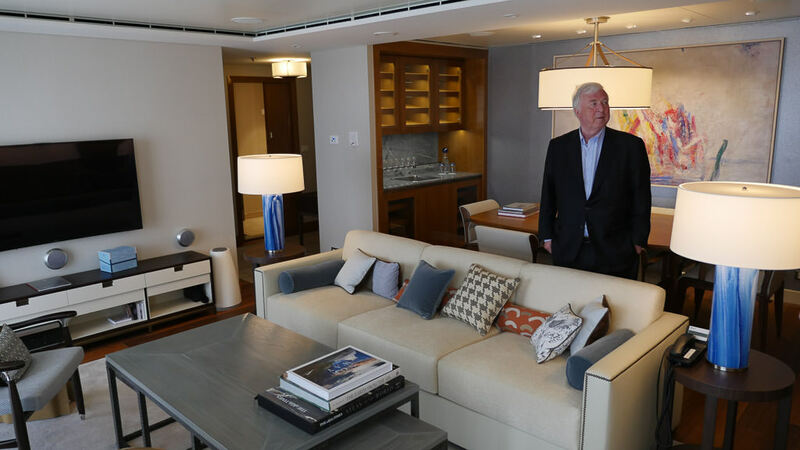 Penthouse Junior Suites measure 405 square feet and feature two separate rooms and an oversized veranda. Since they’re located at the front of the ship, they also provide quick access to the Explorer’s Lounge, Spa, Star Theater and other public rooms. Explorer Suites are larger still, coming in at between 757 and 1,163 square feet. These feature oversized wraparound balconies that overlook the ship’s bow or stern, along with a Viking Explorer Bed that features luxury linens. Last but not least is the top-of-the-line Owner’s Suite designed by Viking Chairman Torstein Hagen himself. It spans a massive 1,448 square feet. Viking Star operates a variety of itineraries in Western and Northern Europe, along with sailings through the sun-splashed islands of the Mediterranean. These include the 15-day Viking Homelands from Stockholm to Bergen; the 15-day Passage through Eastern Europe from Bergen to Barcelona; the 13-day Mediterranean Odyssey from Barcelona to Venice; the 10-day Empires of the Mediterranean from Venice to Istanbul; and three multi-voyage segments that range in length from 22 to 50 days. 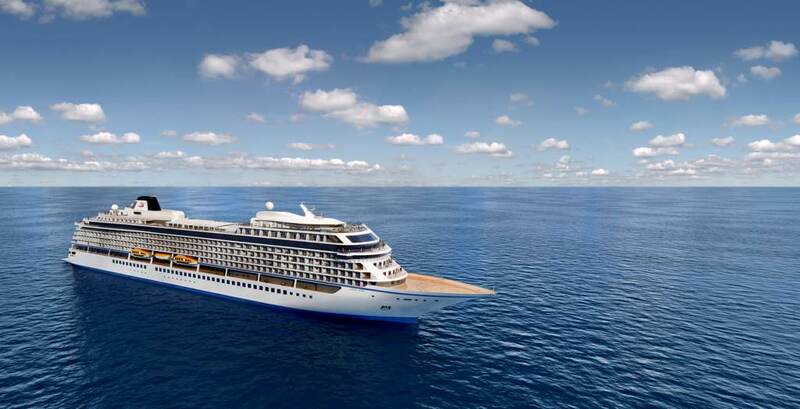 Viking has every chance of making Viking Star the darling of the cruise industry in 2015 by bringing the company’s experience and identity from the river cruise arena to deep-ocean cruising. We’ve cruised on her twice already. Read our reports here: Search all of our stories, including first-hand reports, from Viking Star. Mr Grizzle, your review of Viking Star is concise, yet pretty informative considering the little information officially released by the new Viking line. It was of huge help for me, since I needed such info for one of my surveys. Thanks very much. I’m definitely eager to learn more about Viking Star. I’m sure new info will be trickling out. Viking markets primarily to English-speakers who are 55 and up. Hi Ralph. If you are going on the Viking Star ocean cruise from Venice to Barcelona, what side of the ship would give you a view of the land when in port (docked)? Lots of ports to think about and the ship could be turned, etc. Leaving Venice is beautiful, but I’d be out on the top deck. Barcelona, it’s almost better looking out to the sea. Lot of variables. I am currently on the Star enjoying her maiden voyage. Apart from a few minor glitches to be expected on any first sailing, the cruise is fantastic. I’ve only done one cruise – with Seabourn – and absolutely loved it. I want to do the Homelands cruise on Viking Star, booking a Deluxe Verandah Statement. Which level and whereabouts on the ship should I try and access that would be good for feeling very little movement and away from laundries, kitchens, etc? Thank you. I board on May 2. Watch for reports then. Thank you. I was on deck 5 and liked it. The ship is very quiet, except for an issue they are having (which will soon be fixed) of the stateroom doors not latching, so people are forced to slam them. Definitely want to go midships, but she was largely stable, even in semi-rough seas. Hi Roland, Thanks for providing the link to the Cruise Critic user reviews. Please provide us with a little context as to the value you think the link provides for readers. Are you the ship? Is this your review? http://www.cruisecritic.com/memberreviews/memberreview.cfm?EntryID=503824 We appreciate all perspectives to help people make informed decisions. Thank you. I did end my cruise when I posted this. I think the worst aspect was not that the Viking Star woefully failed in so many areas, but that corporate and ship executives totally failed to respond to their guests. The poor lady at the Explorers Lounge was beseiged with complaints and requests to see executive level staff and crew but was stifled by them. This poor lady endured day after day of complaints but the cowardly cruise line and ship executives refused to address any problem. Instead of taking it as a learning experience, they hid like cowards. When I think of all the ships that sank with high level ship offices abandoning ship first, I think that is what Viking would do also. Bottom, Viking had major problems. Face the fact and learn from them instead of hiding. It is the customer that has to be satisfied in the long run not individual egos. The ship was large enough to satisfy all passengers. Have at least one venue that caters to passenger who still have a little life left in them. 80 & 90 year olds still like to kick up their heels once in a while. Classical music in the Atrium and during tea is perfect. But everywhere? No dancing? Nothing livelier than a knitting class? Viking is cutting out a huge over 55 affluent clientele that still is mentally and physically alive. We have taken a Viking Rhine river cruise, which was wonderful. We were very impressed with the rooms, service, and food. In May 2013, Viking announced the creation of their ocean cruise line starting with building the Viking Star, which holds 930 passengers, and was a 15 or 30-day Homelands cruise that was traveling to the Baltic. We were the third couple to book this cruise on a ship that had not been built yet but were able to see all phases of that process via email from Viking. Late July we flew to Stockholm to begin our cruise. We got to Stockholm, Helsinki, St. Petersburg, then on the way to Tallinn, one of the ship’s motors went out. We then continued to the Tallinn port on one motor, then when almost there, that motor went out and I believe we were towed into port. To make a long story short, the transformer went out, the parts that also needed replacing were custom, and although we were told a couple of times we would miss the next port or the following port, it was then announced that the cruise was canceled. We were then given a letter that gave us a choice of being flown home from Tallinn or being flown to Bergen, we chose to go home. We have since followed up with passengers that chose Bergen because of scheduled post trips, but do not know what happened to those passengers that were taking this cruise to Barcelona for the entire 30-day length of this cruise. We were told that they were flown to Copenhagen and would pick up the ship there, but would miss the London port. Needless to say, this was very disappointing because we waited over two years for this trip. That being said, let me say that Viking is a company that is run by people high morale character, meaning that they tried to do their very best by their passengers. I can only imagine the logistical nightmare of getting 930 people off of the ship in two days, and to other locations as well–airline reservations, accommodations at hotels in multiple locations, excursions for people waiting for their post-trip or for the ship–it is mind boggling. We absolutely loved our room, our room stewards, the staff, the food, and the beautiful ship. We received incredible restitution for this cruise. Part of that was a cruise credit, which we have used toward a Christmas Markets cruise on the Danube this year. We are also re-booking this same Homelands cruise in reverse order (just in case) in 2017 because Viking is the only cruise line that is all inclusive and very reasonable for the number of ports, excursions, and extras you get included in the price. Under these extreme circumstances, I would highly recommend Viking cruises without a doubt. Thank you so much for sharing your experience, and we are happy that Viking did the right thing in your view. Issues can happen with any ship. Simply bad luck for Viking. My sympathies go to all, the guests, the crew, Viking and the destinations that were expecting you. I have read other accounts of this cruise and find, in general, some people were very unhappy and displeased with Viking for what happened. I even heard rumors of people calling their attorney’s while on board. I believe upsets, although extremely disappointing, happen–that’s life in general. I guess it depends on how you view the world and the big picture. Perhaps the ship’s motors breaking save all the passengers from a more catastrophic situation??? Perhaps not, but certainly this was not Viking’s intent, because they lost millions of dollars on refunds, cruise credits, hotels, excursions, and flights. We would have rather had a complete cruise and brought back the memories we expected, but we did bring back nice memories and re-booked this trip to make up for lost ones. All the information I see describes king size beds. I will be traveling with a friend. We would prefer separate beds, is that an option? Yes. It is an option. My wife and I have not begun the cruise as yet but unfortunately have experienced the absolutely horrible Viking service resources who “help” with excursions and flights. The latest issues experienced, beyond the misinformation provided to my wife while attempting to book our excursion, were related to seating assignments and flight layovers once back in the states. Seating assignments: Viking booked both of us in the worst seats on the aircraft for the Barcelona to Newark leg (the ones marked in red on the seat guru site) and they didn’t even have us seated together. When asked to change our seats they refused and recommended we work with the airlines. Now that’s what I call service. Layover: Viking booked our return trip with an eight hour layover in Newark when they easily could have booked us on two earlier flights. I’m not an experienced Cruiser but I have traveled on business for over 30 years and this level of service should not be acceptable to any traveler. I am hoping that once we begin the cruise the service improves significantly. We never use the tour company to book flights . Somehow it never works out. We are thinking of taking a Viking Ocean cruise in May; does anyone know if Viking allows a third guest in their suites? If so, where would I find that additional cost? Good question. I can tell you that there would definitely be an extra cost. I don’t know how much, however. Do you work with a travel agent? My parents have referred us to one they use, I will let everyone know what she says. Are there mah jongg sets on the ship ? Love to play!!! Took Viking Star Venice to Istanbul March 2016. Our luggage arrived 2 days after we did. Viking’s accomodation for this (they booked the flights) was to clean our single outfit nightly. The ship itself is top notch, bright and comfortable and cabin attendants fine. Service elsewhere was spotty and info inconsistent. The price of spa treatments for example differed depending on where you looked. We had a penthouse veranda which was to include restocking of the minibar daily; this was true only as to liquor NOT the wine. We had taken 3 prior river cruises with Viking and always found the included wine acceptable. This was not always the case on Star. While wine and beer was to be included with lunch and dinner it was difficult to get refills. The online calendar seemed like a good idea until our 3 restaurant reservations were all wiped out somehow. Being able to book the specialty restaurants early was another perk of this room category. After much discussion they were restored mostly at later times than we had chosen. Virtually all spa appointments were booked up immediately so there was no to very limited availabilty. Many of the employees had only worked on the ship for a very short period and it showed. The included tours overlapped the paid tours so it was impossible to take advantage of both. The one day we booked both an included and paid tour, the included was cancelled with no notice to us so we could not take advantage of it. Again, they simply manipulated the online calendar and deleted the sceduled tour without advising us. Show tics and tour tics had no time on them so you had to double check this yourself and write it on the tics. All in all this was a very disappointing experience especially for the price we paid. One other surprising fact – there was no welcome letter or cocktail party recognizing and appreciating the fact we were repeat customer. This was a furst for hs. This trip has caused us to consider whether we will travel with Viking again. It is indeed unfortunate that this beautiful ship was apparently sent out before the staff and service were up to snuff. Can anyone tell what the free wifi is like on Viking Star? We did a river cruise with Viking 2012 and the wifi was not usable at all, waste of time, thanks. I was on board last year at this time and it worked very well. Was fast, but of course, your mileage may vary as they say. Ok, thanks Ralph, we are doing a 23 day mediterranean cruise on star april 2017 so thats encouraging. We are going on the Vikings Homeland cruise in June. I’d like to get a realistic idea of what clothing to pack. We aren’t dressy people, can we get away with nice slacks and golf shirts (husband) and nice slacks, long skirts and tops for me. This facebook picture is from a cruise and this would be typical evening outfits for us? Thanks for the help. Having been on previous Viking river cruises and enjoyed them & told people they would have top notch experience with Viking, we decided to try the new Viking Star cruise Venice to Istanbul. Very disappointed. The ship is very nice, dining OK but not conducive to sitting with fellow passengers seating is twos, fours and some sixes in the World Café. Occasionally getting back from tours late the World Café dining room would be closed. Breakfasts at the World Café, trying to find a table for 4, staff not helping like on the river cruises. Breakfast was available in The Restaurant but finished by the time we wanted breakfast. Announcements very hard to hear, eventually after 3 days worked out that if you brought up the bridge camera on the screen & turned the sound up announcements heard.. This needs to be explained by the cabin staff to passengers when they board.. The Captains welcome, people still ashore in Venice so was missed. Istanbul tours cancelled due to conflict in the area, told we would have refunds within 2 weeks, did not happen. You are not given a final account, it has to be checked on the screen in your room. Refunds converted from US$ when paid in $AU so amounts paid not fully refunded. Silver package not worth the money, wines asked for from the wine list told sorry that’s not on the silver package. All in all very disappointed serious thought will have to be made about another cruise with Viking.. If you are planning to take a Vikings Ocean cruise, you might want to think again. We took the Viking Star Ocean cruise, Passage through Western Europe, leaving Barcelona on 4/17/16 and ending in Bergen, Norway. Though the boat and staff were fine, the Viking Corporate management, their honesty and communication were horrible. They advertised (and we signed up for) 11 ports of call based on their brochures and ads, but they changed our particular voyage to 7 ports without notice or reason, resulting in 4 less ports of call than what we paid for and expected. Second, we had a virus outbreak on board with all water related facilities (pool, hot tubs, steam room) closed for 50% of our trip. Our attempt to regain some compensation for the services we paid for and never received has been beset with minimal offers of vouchers on future Viking cruises, required non-disclosure contracts to sign and a final ultimatum to accept the offer. Their offer was unsatisfactory, an insult, and insufficient restitution to refund monies paid for services never received. Viking has refused any further communication, despite our efforts. We were loyal, high paying, returning customers who apparently are not needed nor cared about. Never again will we take a Viking Cruise. There are many quality cruise options out there and we would strongly suggest you steer clear of Viking cruises. Upset and unhappy in Ponte Vedra Beach, FL. We just completed the baltic tour. The food and food service needs a lot of work. Cold food at the carving station was blamed on us walking to slowly to the tables. Water and wine service? not really. we even moved plates to other tables so we could go back for desert. The people are busy but not well trained and maybe a little understaffed. Wines were NOT from the region and very poor – Like Spanish wine with German food – yuk. Not having a money exchange is a big problem. They tell you there are ample ATM’s but never give you time to get to one. That’s a problem when faced with pay toilets. Outlets in the room never worked the whole trip. The spa snow room was out of service for half the cruise. menus were repeated over and over so that by the end I was tired of the same food. Lobster early in the cruise was mushy and not edible. waffle maker was dirty. Staff when asked what was in something would respond with “I don’t know”. The boat had potential, but everything about it seemed superficial. Looks good in the advertisements, but not worth of the ratings it gets. Go to Oceana for good food and good service. Oh, the Iceland pretrip was disorganized. last minute hotel changes, bad communication on how we were to be met, and a waste of money – do it on your own. Flights cost twice what the airlines charged. We just complete a cruise on Viking Star. Ship is 5* but we did the 2 day extension in Venice at the Hikton Stucky! Big mistake! It’s not on the main island of Venice and wasted a whole day waiting to check in and the waiting until 4 pm for luggage. BUT that’s not the worst! Hotel is at most. 2* and I now have bites on my torso and legs! Room was not clean! I’m washing everything in our suitcases!! Never again! Disappointing. I have stayed at that hotel. Yes, the location is a disappointment for those who want to be closer to the action. 4 pm check in, which I think is a disservice, is often standard at many European hotels. Bites though? Unacceptable. Have you contacted the hotel general manager? This is a Hilton issue, not a Viking issue. Please let Hilton know.